Poa sylvestris is a perennial C3 grass (Basinger 2002), 40-80 cm tall, stems tufted, slightly flattened. 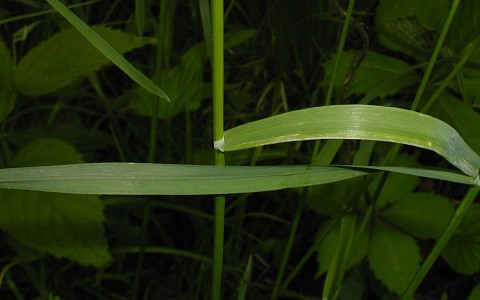 Leaves with sheaths shorter than internodes, ligule 0.1-0.2 cm; blades 0.3-0.5 cm wide, mostly along stem, soft, elongate. Flower spikelets 2-5 flowered, 0.3-0.4 cm long, glumes and lemmas about 0.2-0.3 cm, lemmas finely hairy, base webbed; inflorescence 10-20 cm long, silvery-green, branches slender, s-shaped, divergent, 4-8 at a node, bearing spikelets well beyond the middle; blooming April-June. Habitat: Rich, moist to wet woods, soil pH 5.9-7, tolerant of shade, fire, intolerant of drought, salt (USDA, NRCS 2010).